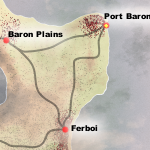 The second largest port in Beromi, Port Baron is home to a healthy merchantile trade, and offers many public services to visitors, including a public Greenhouse for advanced harvesters. A newly conquered place from the Barktomi this is a nice spot for a Shipyard so we can build personal boats and other sailing equipment.This is a new place to arrive from the island too. Guild Compound is located here.